Ms. Yu is a single mother who had been struggling financially to care for her young daughter after losing her job as an electronics Warehouse Assistant. At an Early Childhood Education Job Fair at City College of San Francisco, she was recruited to join APA’s Employment Program. Our staff invited Ms. Yu to attend agency events to network and get support from her peers. She became active in the community: volunteering for Head Start and taking parenting courses. She was motivated but needed help getting her foot in the door in the child care industry. ​​APA staff referred her to a short-term child care position at Chinese for Affirmative Action, and she was later selected for a part-time temporary child care position at one of APA’s satellite offices. 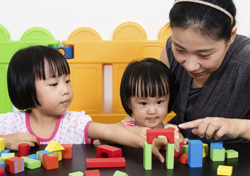 With some work experience behind her, Ms. Yu got a job interview at a child care center. APA Staff acted as one of her references and helped her with filling out forms. In the end she was offered the position of Substitute Teacher’s Aide.